The BSA MCC of NSW Incorporated, on behalf of the combined Australian BSA clubs, is hosting the 10th annual BSA National Rally. 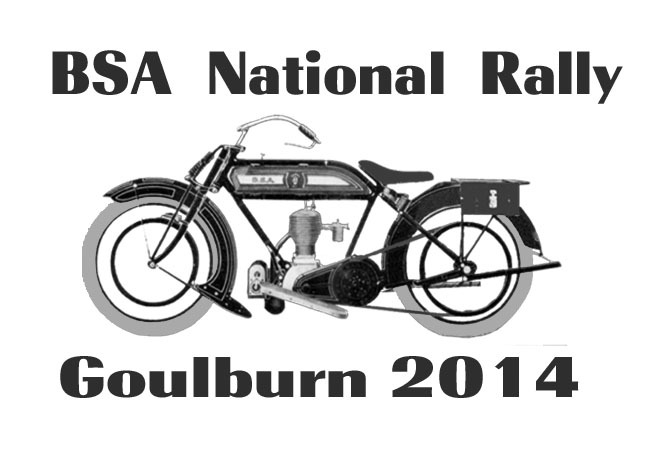 As President of the BSA MCC of NSW it is my pleasure to invite you to join us at this event in Goulburn this year. This is a very significant year being the 10th National Rally so come along and take advantage of being able to meet and mix with the largest and most diverse group of BSA riders from all over Australia, right here in the beautiful Goulburn region. The rally occurs over 3 days and there will be rides each day with back up trailers available on Saturday for any breakdowns. The highlight of the event is the Concours, which happens immediately after the Saturday ride with trophies presented at the Saturday night dinner at the Goulburn Workers Club. As this is a BSA specific event we are able to offer trophies that cover all models from 1910 to 1973. Also, the perpetual NRMA Cup for best BSA at the National Rally will be awarded. So why not come along and become a part of Australian BSA history. Each entrant is entitled to exhibit 3 bikes and the actual judging classes will be determined according to what BSAs the participants list on their prepaid entry forms. A minimum of 3 bikes will be required for a particular model or model type to be an eligible trophy class for judging. Bikes will be judged on authenticity, condition and cleanliness. Rally HQ is the Goulburn South Caravan Park, 149 Hume Street, (02) 4821-3233. Camping & van sites are available and there are a limited number of cabin beds reserved for interstate BSA Club members. Contact your local delegate for more information. Wherever you book, early bookings are essential as there are other events scheduled over the same weekend and some of these motels may already be fully booked. There will be on site catering for breakfasts on Saturday and Sunday. Lunch on Saturday will be on the run so all you need to bring is your tent & your beautiful BSA. There will be a secured area for bikes at the caravan park and a free bus will be provided to ferry participants between the caravan park and the dinner venue on Saturday night. 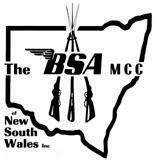 The BSA MCC of NSW Inc is a participant in the NSW conditional registration scheme and, by virtue of being the hosting club, this is an authorised historic vehicle event. Please note that all bikes ridden on public roads in NSW must have some form of current registration appropriate to the home state of the participant. Bikes presented for the Concours need not be registered but, in that case, they must not be ridden on public roads. We strongly recommend that all participants have their bikes fully insured. I look forward to personally greeting you at what will be a fantastic event.